Spring Road Trail, better known as Whitman Spring Trail, is located in Auburn next to Lake Auburn. The historic two mile stretch of trail was once a town road that follows the northwestern shoreline of Lake Auburn and fantastic views of the lake. Whitman Spring Road Trail is a great place to walk, run, bike, cross country ski, snowshoe, and is a great place to walk a leashed dog. 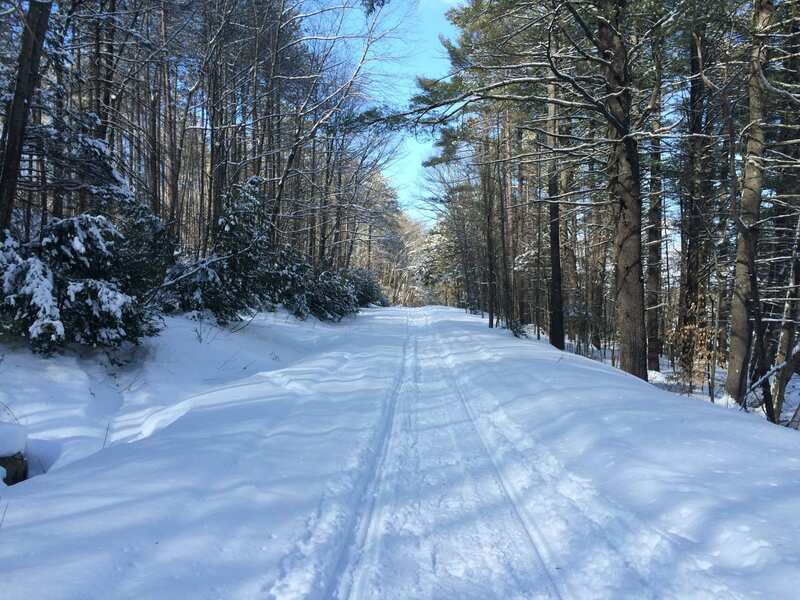 The Whitman Spring Road Trail is also part of a larger snowmobile trail system. Directions: There is access to the trail directly off of W Auburn Road in Auburn. Take a right onto Whitman Spring Road until you reach the gate. Parking is allowed along the road. There is also a northern trailhead which can be accessed from N Auburn Road. Heading north on W Auburn Rd, at the V in the road keep right onto N Auburn Rd (at North Auburn Congregational Church). Continue on N Auburn Road to where the road bends to the right and Holbrook Road is on the left. The trailhead is directly across from Holbrook Road and parking is allowed along Holbrook Road.